At the dawn of civilization a spider crawled onto a twig by a riverbank. A man watched as the twig broke from the shore and drifted down stream. "Hey what a concept!" thought the man as the spider bore away. The first ship model was launched. Ship models accompanied the growth of all society. They served many needs including spiritual, illustrative, experimental, architectural, and instructive. 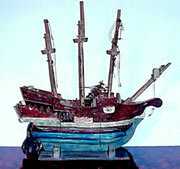 Sailors often built models as keepsakes to commemorate a vessel, voyage or event. They used models to share experiences with family and friends. On long voyages sailors built models to trade when they reached foreign ports. There are stories of exceptional captains honored by a crew who had combined their talents to present him with a model of his ship. Models adorned churches in old Europe. These votive models represented ships of the town, replicas built with hopes of enhancing the blessings and fortunes of those aboard. In the seventeenth and eighteenth centuries, shipyard owners would often present elaborate "admiralty" models to curry favor with those who had the power to authorize construction of the real ship. Into this century, boat builders used plainly carved models to aid in the design of boats before their construction. Half-hull models were used to design everything from lobster boats and merchant ships to America's Cup contenders. This replica by Capt. Parker is based on the clay models of Cyprus from 800 B.C. These models were used as religious icons and temple offerings to appease the gods. Votive model circa 1500. Replica built around 1920. Capt. Parker's collection. In Victorian times sailing and racing pond models were the rage. Many parks at the time were built with accommodation for the sport. Sailor-built model of a three masted American barque circa 1870. Fully restored by Capt. Parker for private collection. models was a great way for neophytes to bring the romantic tales to life. Another important factor was that with the emerging middle class, people were working fewer hours and had more leisure time to pursue other interests. Finally, introduction of electricity into the average home allowed hobbyists to work long into the night. Georgian Style Half Hull. American Privateer schooner circa 1790 built by and in the collection of Capt. Parker.